Pakistan cracked down on Taliban militants within its borders Tuesday, carrying out airstrikes in its northwestern region, a Pakistani military spokesman said. The appeal by Abdelbaset Ali Mohmed Al Megrahi at the Criminal Appeal Court in Edinburgh is expected to last four weeks, a court spokeswoman said. Megrahi was convicted of the Lockerbie bombing in January 2001, but he maintains his innocence and fought for the right to appeal. After he brought his case before the Scottish Criminal Cases Review Commission, they decided in June 2007 that there were grounds for appeal and recommended the case go back to court. The appeal starting Tuesday is the result of their decision two years ago. 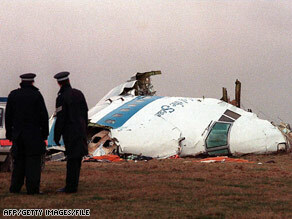 Megrahi is serving a life sentence at Scotland’s Greenock Prison for his role in the December 21, 1988, bombing of Pan Am Flight 103 over the Scottish town of Lockerbie. The bombing killed 270 people, including 11 on the ground. A Scottish court ruled in 2003 that Megrahi must serve at least 27 years of his sentence before becoming eligible for parole. He was diagnosed with prostate cancer last year and the court heard Tuesday that his health has deteriorated recently. Megrahi was convicted after the prosecution argued he had placed the bomb, hidden in a suitcase, on a flight from Malta to Frankfurt, Germany. There, prosecutors said, the bomb was transferred onto the Pan Am plane that went first to London’s Heathrow Airport en route to New York. Another man — Al-Amin Khalifa Fahima — was also tried in the bombing but was acquitted. The prosecution maintained Megrahi, who worked at Malta’s Luqa Airport, was an agent for the Libyan intelligence services and had been seen buying clothes that were in the suitcase that contained the bomb. Libya has formally accepted responsibility for the bombing, though Libyan leader Moammar Gadhafi later denied any culpability. Five judges are hearing the appeal, with Megrahi participating via a closed-circuit television linkup from prison, a court spokeswoman said.